overall view of the truck, 2010 Rosenbauer 85' Aerial. 500 gallon water, Foampro system, Cummins ISM engine, Allison transmission, Honda generator, 8 man cab, and a Darley LDM pump. Joel, interesting set of photos, thanks very much. I must confess I had to Google to see where you were, which is what makes this site all the more interesting. Have you any pics of the aerial this new truck replaced or any of the older trucks, thanks? Added by Pavel on 26 October 2010.
over at St Croix now, which is another island in the US Virgin Islands. 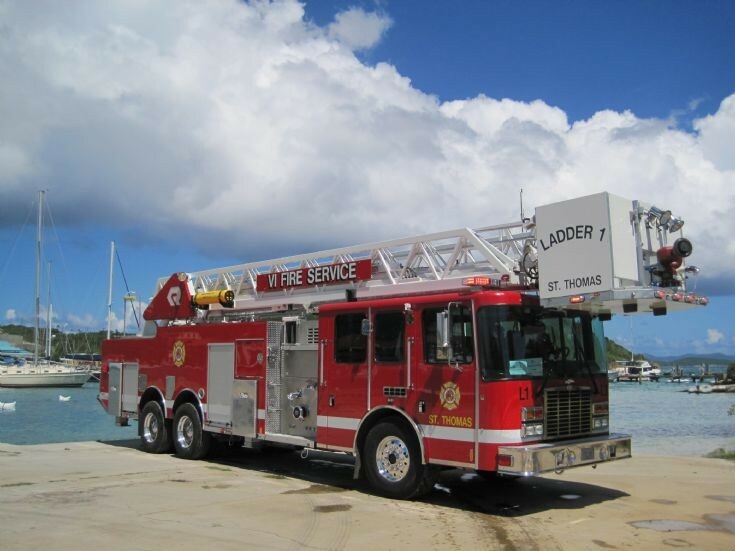 Seems their trucks are almost identical to St Thomas - a Tanker, pumper, command unit and now the ladders. The ladders are new additions and firehouses are yet to be built to house these. They have not had a ladder truck in quite some time, and their last ladder has long since been out of commission.